Get 40% off your entire purchase at Ann Taylor with code WEEKEND40. Sale ends tonight 6/15 3AM ET. 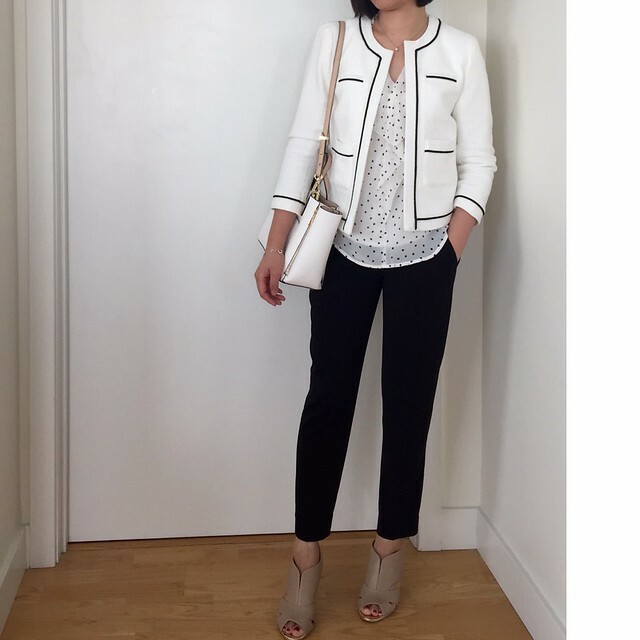 I ordered this collarless tipped jacket in 0P (as seen here) for a really great price of $61.30 plus shipping after I tried on size 2P in store (review here). Size 0P fits me well but there is a slight boxiness to the fit that you can clearly see when viewing the jacket’s fit from the back. Refer to the below picture on the right in my pairing with the LOFT black lace dress (old). Given the intended fit I’d say this jacket runs true to size. I wish it had a darker lining because white jackets are prone to sweat stains at the collar and armpits that yellow over time. I recommend dry cleaning this jacket before stowing it away for any length of time in order to prevent unsightly stains from settling in. I wish the jacket was more cropped as I personally found it limiting in what I wanted to pair with it from my closet. I paired the jacket with an above the knee dress and slightly longer tops for a lengthening effect. The jacket would look great with brighter pieces as well but I kept to a black and white palette in the below pairings. In other sale news, Forever 21 is offering 20% off for friends and family with the code F21FRIEND and FREE shipping on orders over $21. Sale ends tonight. 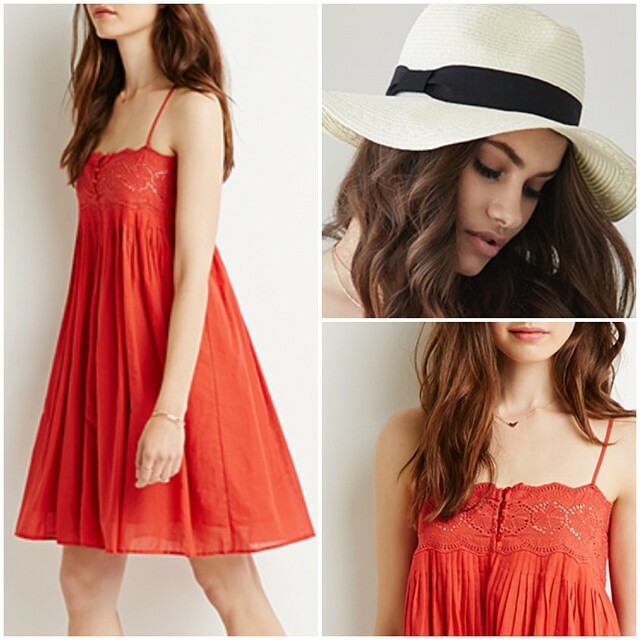 I had some store credits to use so I ordered this pretty red embroidered pintuck cami dress and wide-brim straw fedora hat to try. To be honest, I wasn’t too satisfied with the quality of the ‘Marcella’ Raffia hat I got from Nordstrom in this sale post so I’m still looking for a cute hat for the summer and I’m hopeful this one may work. I expected much more from a hat that was originally $160 but it was made in China and it was way overpriced even at the sale price. At the same time, it’s super cute on (see it on me here) so I’m going to hold onto it for now since Nordstrom has a really good return policy if I change my mind. Yes, I know I’m really indecisive. Speaking of cute hats, I saw this wide bow sunhat but the ribbon color I wanted is currently out of stock.